One girl's guide to being a Seoulite. Walk down the alley and you'll go round to the back of the building where you'll enter the bar. Back here the interior is completely different. Gone is the light and airy cream marble interior and ornate European styling. In it's place is an dark uber trendy room, dimly lit by a wall of colored bulbs and the projection screen behind the bar. The bar tenders here are all trained mixologists. That's the official term for someone who really knows how to mix the spirits and liqueurs. If you want to drink a fantastic cocktail you've come to the right place. Just a few of the cocktails @ Cafe 74. The bar has a very extensive cocktail menu. It includes all the cocktails you can possibly name and a lot more to boot. As I said, this is my favourite bar and I always try to choose different cocktails but I've probably tried less than a quarter of them. There is one that I do like to return to every time I visit though. It's the white chocolate martini. Simply put, it's like heaven in a glass to me! It's blended with fresh strawberries and the chunk of white chocolate they garnish it with never fails to put a smile on my face either. White Chocolate Martini @ Cafe Seventy Four (74), Seoul. Me, Seoulsome Girl ;) enjoying my favourite alcoholic indulgence. Inside Cafe 74, Cheongdam, Seoul. Menu on an iPad. As I mentioned it's very very cool in here. So much so that they don't give you a paper menu but an iPad instead. The music like many places in Korea is a mix of House and Electro. It's upbeat and played at a good volume, not too loud so you can't hear yourself speak. On the projector screen behind the bar they play videos of Victoria's Secret (basically lots of attractive semi-naked ladies to you men) Fashion shows and iconic music artisits' concerts. Needless to say cool doesn't come cheap. The drinks here top the price range of Seoul bars. You'll pay between 18,000 to 22,000 won for a cocktail and on top of that you'll pay tax and service (as with most of the upscale places these days). You could order a beer which would be considerably cheaper but let's face it, if you want to drink beer you might as well go do that somewhere else. Come here for fantastic cocktails mixed by professionals and the very swanky atmosphere. Cafe Seventy Four 74 in Cheongdam, Seoul. Cafe 74 can be found up the street that's opposite Rodeo and next to Once in a Blue Moon jazz bar in Cheongdam. Check out my interactive map of Cheongdam if you want to see the exact location. I first visited Seoul back in 2007, the city has grown so much since then. New people, new places, new experiences. There's so much I love. 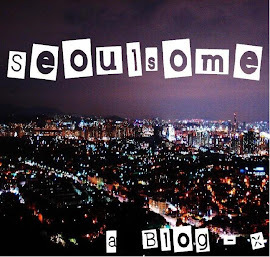 Seoulsome is about sharing the things I like. Enjoy! Where to Buy Halloween Stuff in Korea. Times Square Mall - All your shopping needs under one roof! Tanning in Seoul, Korea - Where & how? Online Costume Store for Halloween in Korea. Seoulsome and its contents belong to me, Seoulsome girl. Don't accept less wholesome alternatives. Awesome Inc. theme. Theme images by Barcin. Powered by Blogger.